All it takes is one scholarship to change a student’s life; one Lodge dedicated to sharing opportunities from the Elks National Foundation; and one Elk who’s passionate about bringing the two worlds together. At Augusta, Maine, Lodge No. 964, that Elk is Lina Michaud, the Lodge and District Scholarship Chair. Although education has always been important to Michaud, she delayed earning her college degree until her kids were further into their school years. Once she did, she felt like everything fell into place, and she wanted to share that feeling with the students in her community. Michaud spreads the word about the Most Valuable Student, Legacy Awards and Emergency Educational Grant scholarships not just when the applications open, but year round. She created a committee at her Lodge dedicated to getting the scholarship word out to other members, local schools and the community. They host events throughout the year, including a Mother’s Day luncheon, Father of the Year Award, and a holiday craft and vendor fair. 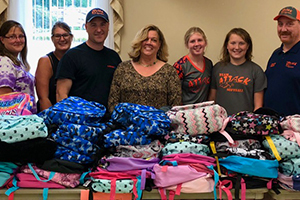 In 2017, Michaud also started a team composed of community leaders, school administrators, clubs and organizations to host a Back-to-School Event. 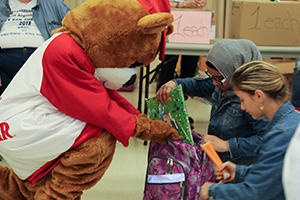 During the event, they distribute backpacks, school supplies, gym clothes, sneakers and more. They also promote the many Elks programs including the Hoop Shoot, Drug Awareness and, of course, scholarships. “We take great pride in knowing that members of our community are learning about all the great work of Elkdom,” Michaud says. This year marked the second annual event. 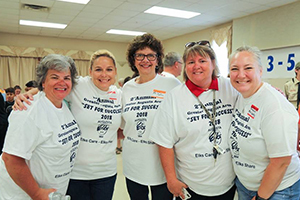 More than 125 Elks and community volunteers helped put on the event for more than 300 students and families. The Lodge received useful feedback, like how parents can’t always rely on their kids to share scholarship opportunities with them—this event changed that. The Lodge's work continues long after the scholarship winners are chosen. Michaud is dedicated to building a strong relationship between the scholarship recipients and the Lodge, and she’s confident that your Lodge can do it too. Michaud says the key to building this relationship is three-fold: show the need for these scholarships in your community, present a plan to community and Lodge members, and ensure they follow through by recognizing their input. “People tend to get involved and stay involved if they feel the love,” Michaud says. Michaud shows the magic that comes from opportunities and awareness colliding; and one scholarship, one Lodge and one Elk who makes it happen.